Changing course has lead people to criticize me because they think I am wasting other people’s time and money. That critic would have been fair if Yrvind Ten had lead to nothing. That is not the case. Valuable knowledge has been gained. 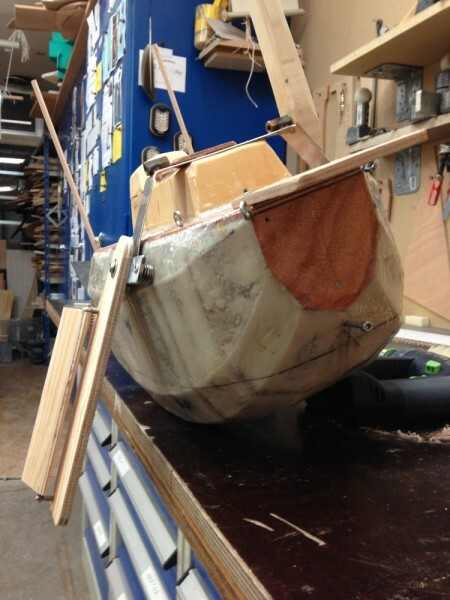 Much progress has been made that can be used on other small boats. Serge Testas, Acrohc Australis was not twelve feet. In the back end she had a big outboard engine and in the forward part a bowsprit. Although these things no doubt could be removed, they were permanent. This is not against common practice, and it’s the duty of o person trying to brake records to try to stretch the rules and to find loop-holes. Tax layers do that all the time as do people involved in for example Am Cup. 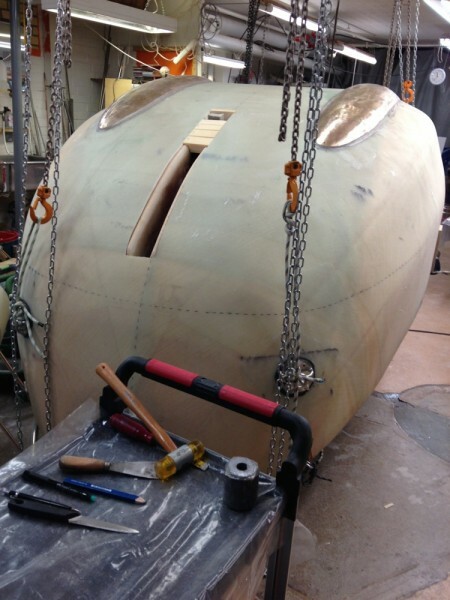 I mention earlier the “Hula” that added unmeasured buoyancy to New Zeeland’s Am Cup boat. 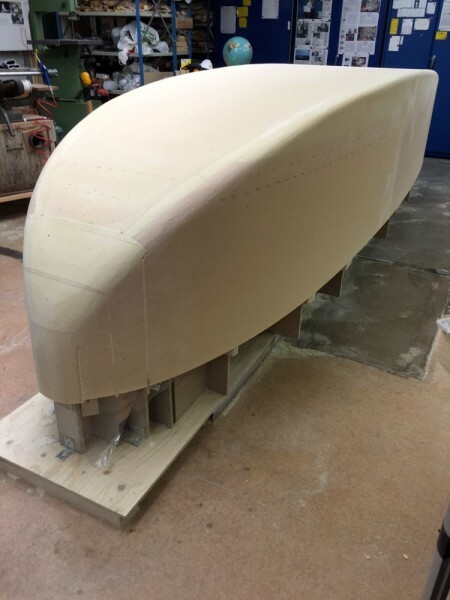 On a ten feet boat you could add huge twin buoyant rudders, then locking them making it into an twenty feet trimaran and still sail within the ten feet rule. 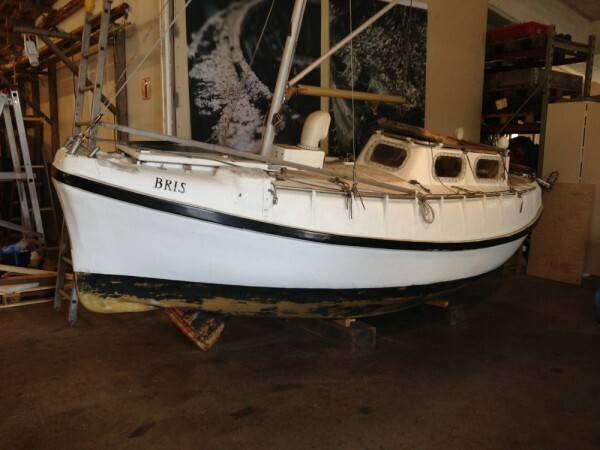 Hugo Vilens April Fool was not a healthy boat either. Not before he added an outboard engine could he get offshore. Gerry Spiess and Serge Testa also had to use engines. I believe a small boat should be able to manage with an oar. I realized that if I did not bend the rule some other designer would, but when I started I did not realize how much the rules could be bend. Size cannot be determined by only length. Living with Yrvind Ten for tree years did teach me to think small. She was a stepping-stone to a much smaller and saner boat, Yrvind Ex Lex 4.5 x 1x 0.2 meter displacing 500 kilos a third of Yrvind Ten. I have talked this over with my sponsors and friends and they are willing to continue to support me. In fact some of them think it’s a very good idea. 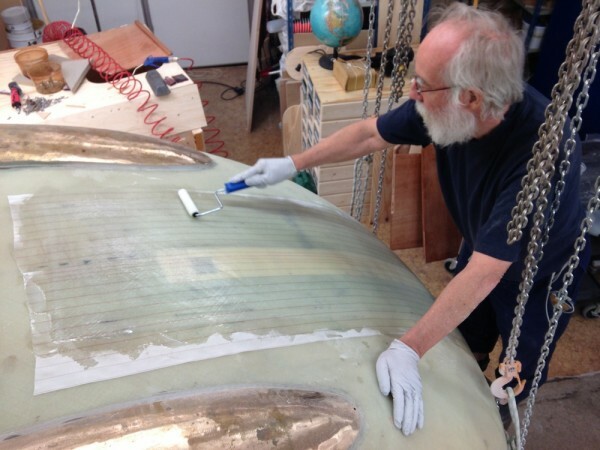 Quite a few of my supporters are turning up here in Västervik Saturday 16 of May to help me to laminate the new hull. First I will give a public illustrated talk at Bankens Dag 13:00 in Biostaden together with Captain Thomas Grahn. Everyone is welcome to the talk. 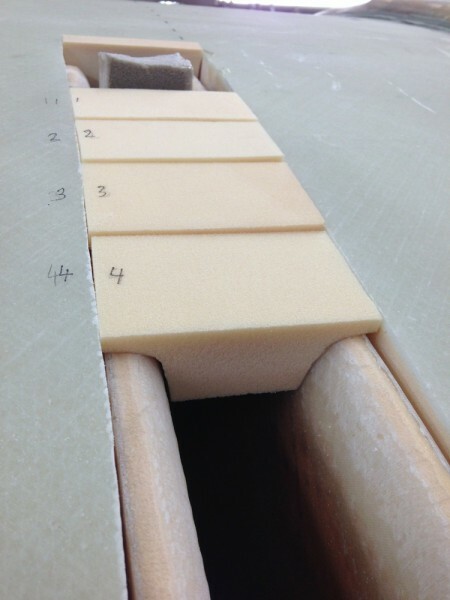 Below the 4 cm thick Divinycell core of Ex Lex ready to recive the NM-epoxy lamination. Why would anyone spend time and money trying to find a solution to such a simple task as securing a hatch? Builders of production boats ignore the problem. Professionals try to get away with as little as possible, amateurs do their best. In this case the leek proof hatches subdivide my boat into a number of waterproof compartments. 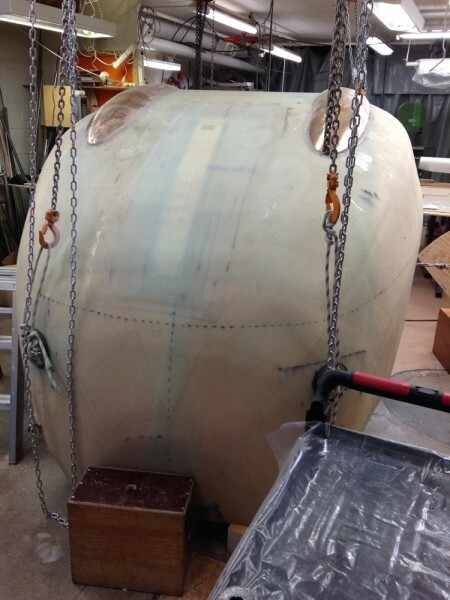 The stored items gets protected from the elements and in the unlikely case of the hull getting holed they give flotation or contain the damage to the holed compartment. 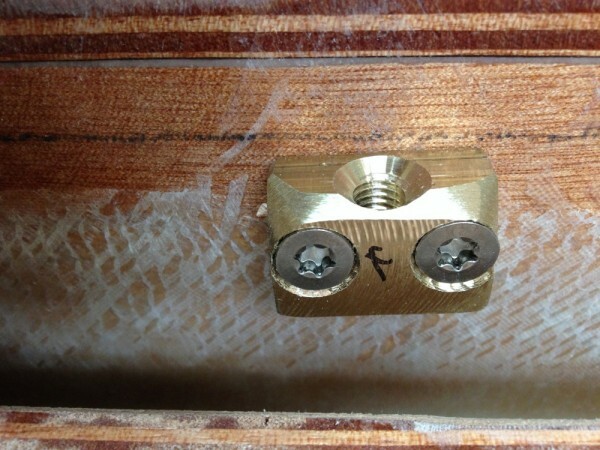 It is true that a wing nut style bolt head or a simple small “T” handle welded to the Torx bolt head would make it easier to undo the bolts without any tools. I try to reduce the number of objects that can hurt me. 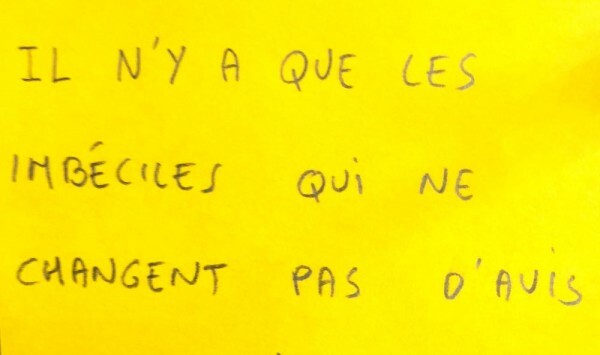 That’s why I forgo that solution. I do not think that I am likely to loose my Torx tool. 1976 I started to build a 19 feet aluminum boat. June 1980 I rounded Cape Horn with her. 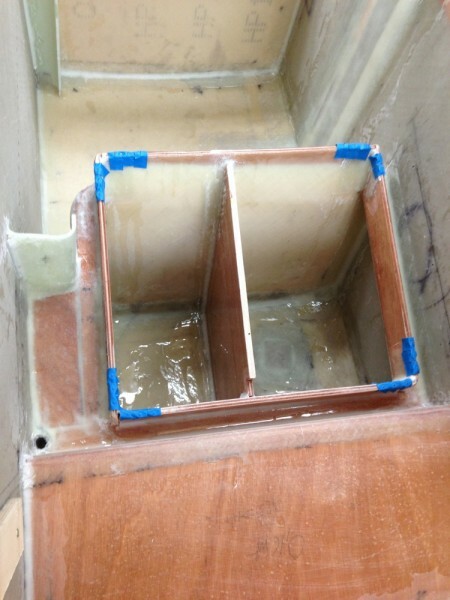 I divided the boat into several waterproof compartments bolting down the hatches more or less the same way. 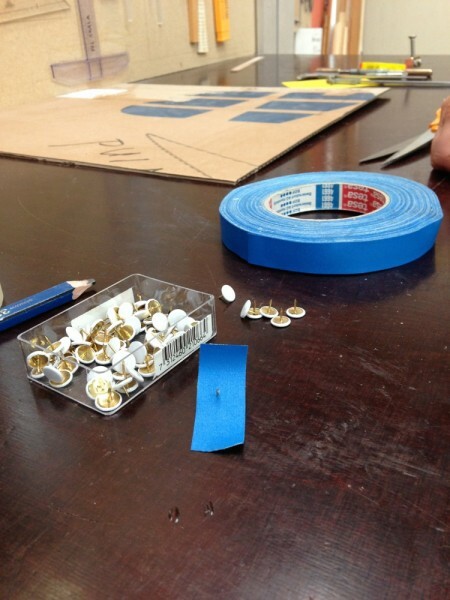 Obviously at that time there were no Torx bolts so I used hex heads. I had about 200 of those bolts on board. I still have quite a few of them M6 25 mm long. Not only do I have the bolts I also still have the tool. I used the same system on some of the hatches on Amphibie-Bris 89 sailing to Newfoundland and on Yrvind.com 2011 sailing to Martinique still the with the same tool. Torx tools are not cumbersome I will bring a score. Foto showing the tool I used on my voyages since 1978. A bit rusty after the Martinique voyage but still functional. 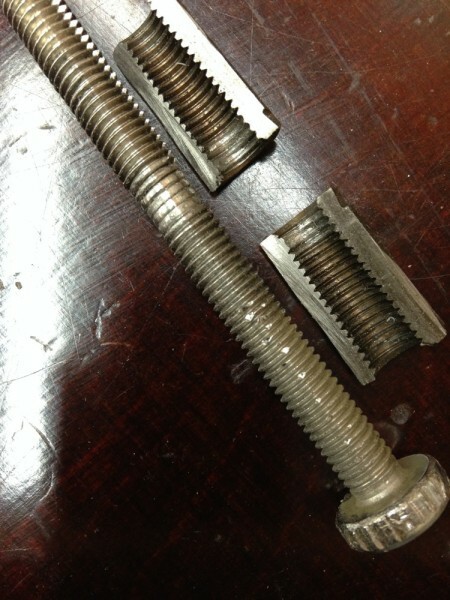 Will the screws fail due to metal fatigue? I do not think so. 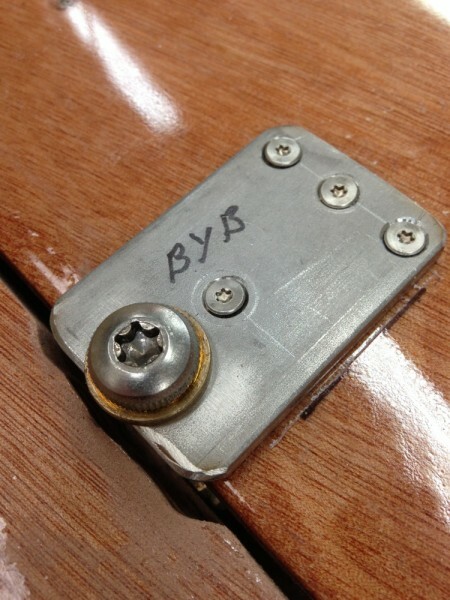 There are fore M8 screws to each hatch. M6 would be plenty, even M5. I am even sure four M4 would do the job. There is plenty of redundancy. Over center latches are good but here the geometry is not suitable for them. Knots have been suggested. Knots are good. I have used them in in the sleeping room below the bed. 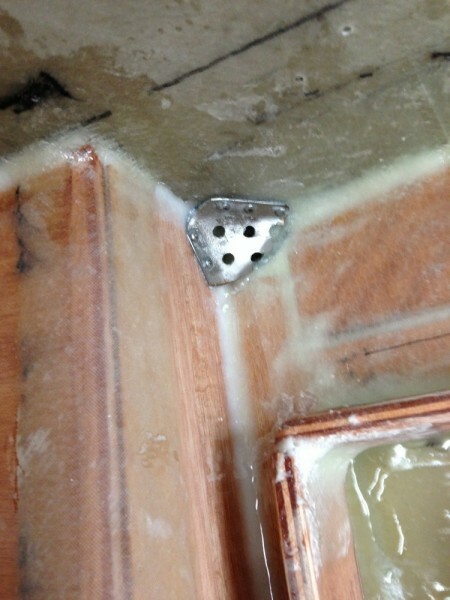 Those hatches do not need to bee waterproof because the whole room can be sealed off. I have knurled the screws. Thus on fine days I need only to screw them down with my fingers. When the sea starts breaking I tighten them up. 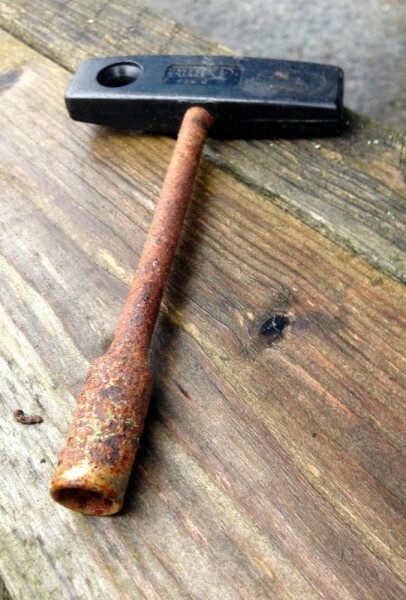 Have you ever been surprised at what a difference a few drips of oil can make to a rusty tool? 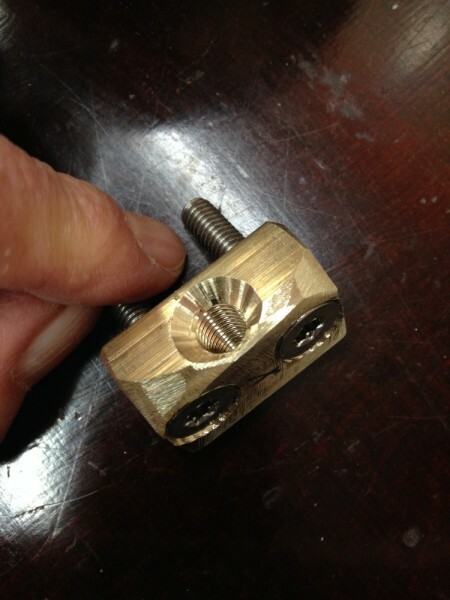 The bronze washer is there to reduce friction and it works like oil. 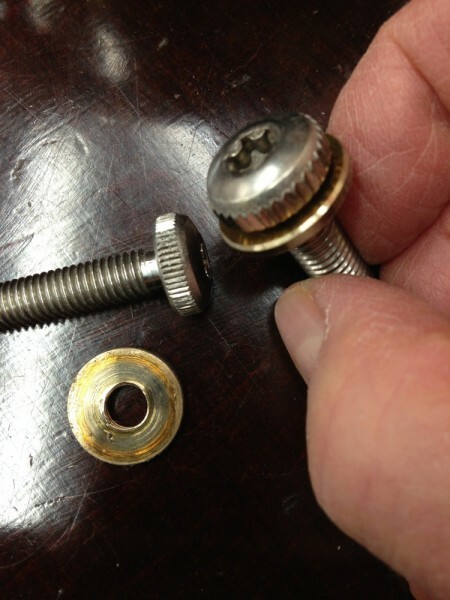 Now if by turning the screw the threads on the washer will be damaged so that it get stuck there permanently? So what? The better. 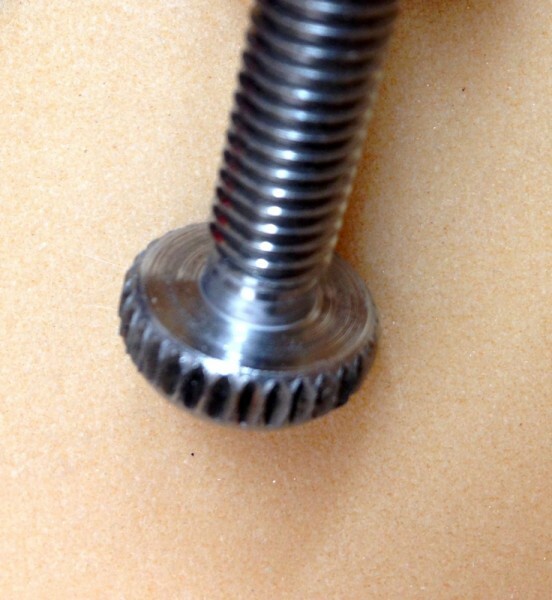 Photo showing knurls and cut away threads near screw head. I will bring hundreds. Photo showing hatches in bedroom secured by lashing. 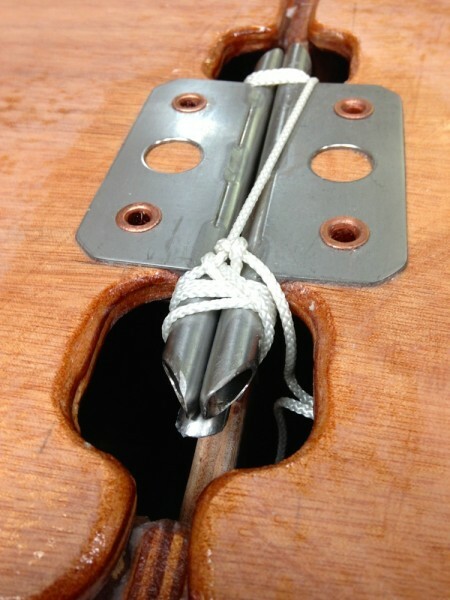 The system consists of three “cleats” and a string. There are twelv compartments below the bed. The matrass is divided into three parts for easy acces. To my disappointment the presentation of Yrvind Tens slotted leeboards was not universally met with rapturous applause. Some people think they will cause too much drag and not be strong enough. Therefore I valiantly feel obliged to come to their defense. Aviators did invent the name but not the flaps, navigators did. 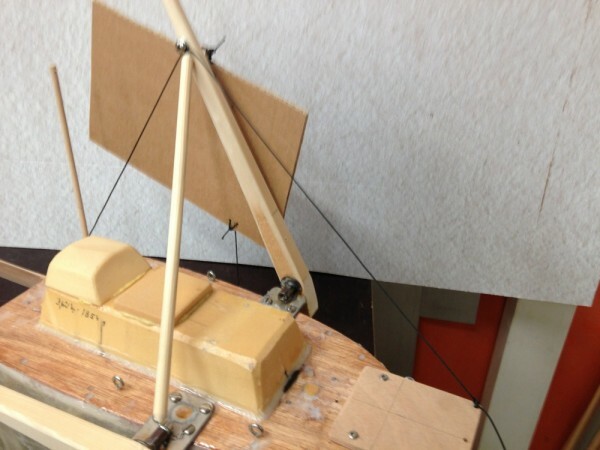 The classical rudder attached to a long keel is a flap. If the tiller is moved a few degrees to weather the boat becomes more weatherly. 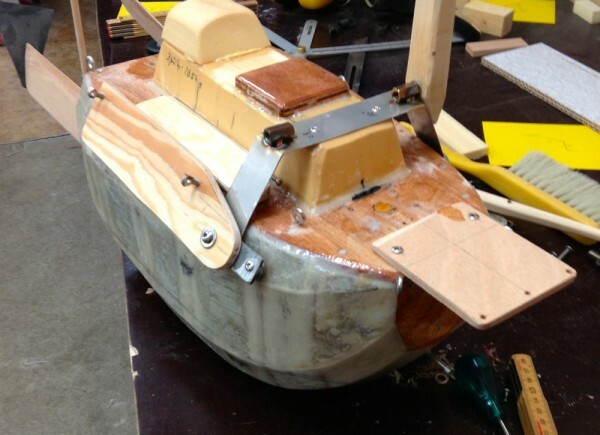 That the rudder in that position creates a bit more drag is a minor point as long as the boat wins races. On the other hand, going to the extreme by moving the sail area forward so that you can keep the tiller 10 or 15 degrees to weather will increase the keels lifting force even more but then the drag will be so great that the boat has no chance of winning. 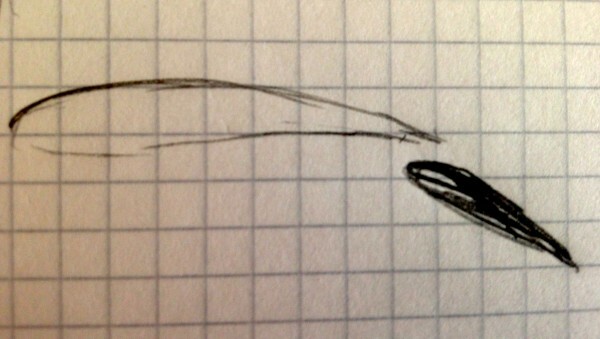 If the boat is propelled by sail and not an airplane engine the flap can and must of course be designed accordingly. I also like to point out that the leeboard is overlapping the flap. Therefore it will be attached not on the foils weak trailing edge but more forward in a position, strong enough. From a fluid dynamic point of view the constellation mainsail and overlapping genua is a slotted flap as A. Gentry has shown. Land yachts use slotted wings and they are very fast. 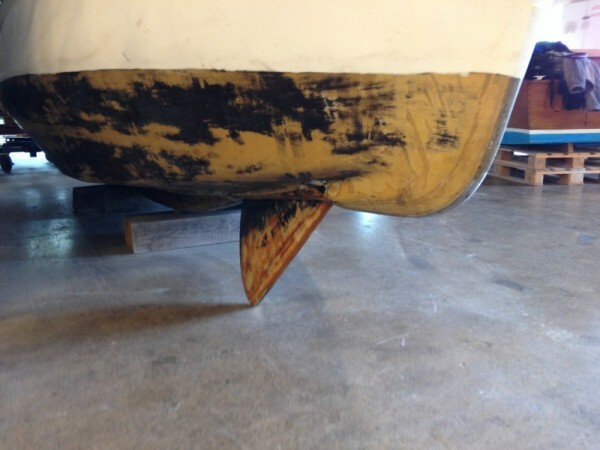 To my mind if slotted flaps can be used on sailing boats for rudders and sails I see no reason why I should not use them on my leeboards, its just a question of good engineering. Why do I not use a long fixed keel as is suggested? 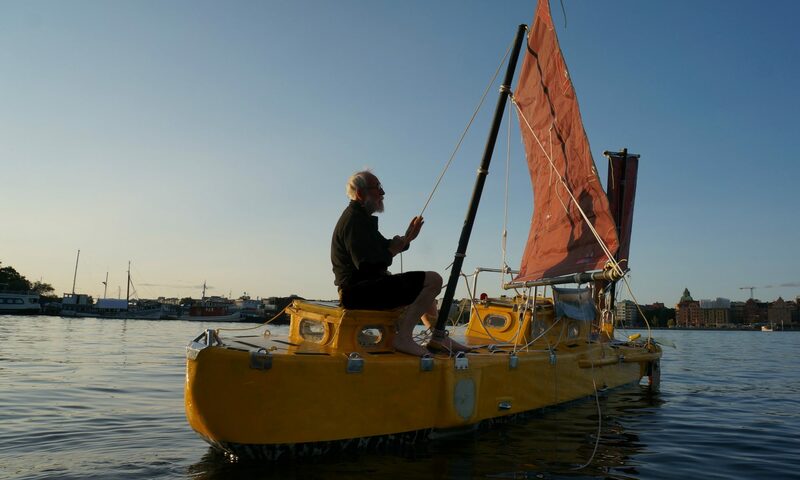 Well it is certainly quite OK for heading into gales, but in my opinion, a centerboard or leeboard placed well forward the sail area is a much better option, and like I have said before, when retracted less likely to capsize the boat. It gives you a choice. 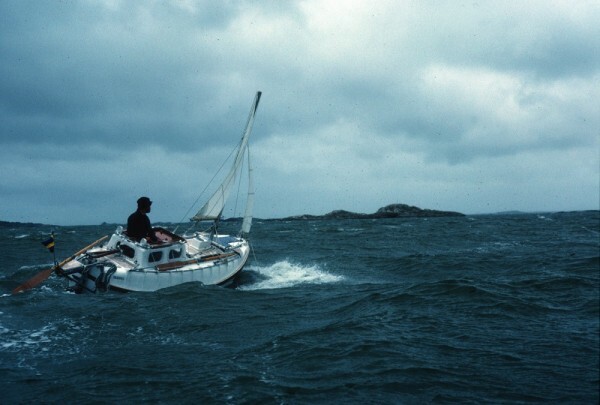 1989 I sailed the 15 feet Bris-Amfibie from Ireland to Newfoundland against the prevailing westerly’s. The mast was ten feet long. In heavy weather I had a 1 square meter jib and a 2 square meter triangular main. Between 6 and 18 of June we had continues contrary gales. The boat had a centerboard. It was placed well forward of the mast. Its area was about ¼ of a square meter (0.6 m deep x 0.4 m cord). Finally after 12 days the sun came out and I got a chance to fix my position. To my joy it was more westerly then when the gales had started. We arrived in St Johns after 47 days. It had been a stormy passage but no capsizes, nothing broken, all the plastic jerry cans topped up with rainwater. Before leaving Sweden I gave some yachtsmen lessons in celest navigation. They where bound for Nova Scotia. “We might see each other on the other side” I suggested. “I am not so sure” their captain said. It was an argument plausible enough. After all they had a modern powerful 35 feet boat equipped with a strong diesel engine, big fuel tanks, radar and all the other stuff. I had my oar and sextant. In the end we never meet them. The North Atlantic had been too stormy that year, they later told me. After two weeks they had turned around and run. Everything was a mess in their boat. Later they sold her. The problem with a long fixed keel like the one Manie B is planning to have on his ten footer is that going downwind he will get weather helm and a lot of drag. On a circumnavigation there will hopefully be much downwind sailing. Leeboards on the other hand, they have even less drag than centerboards because the smooth bottom will cause no turbulence. In strong following winds I will use my twin rudders like a snowplow giving her a lot of inherent course stability. All my experience and all my knowledge speak against the long fixed keel. Please do not use it. I never go back to it. Below are some pictures of Bris Amphibie. The centerboard can be lowered further had not the floor been there. Click once or twice to enlarge. Above Bris Amphibie sailing her main is 2 meter square her jib 1 meter square. 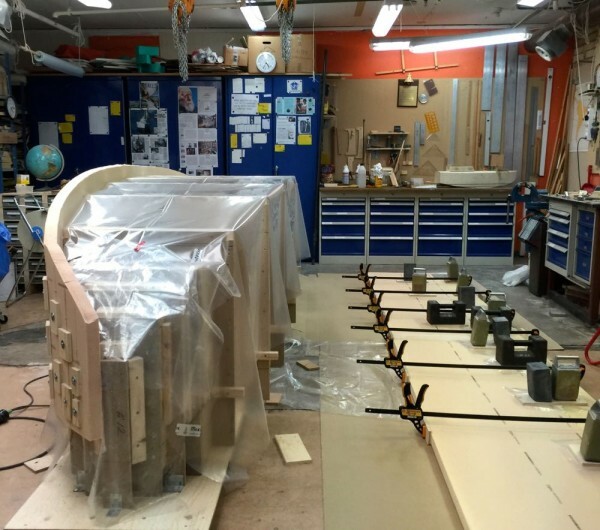 A bit of the centerboard can be seen. Every sailor knows, or ought to know that the force created by the flow over a foil increases with the square of its speed. If Yrvind Ten would make three knots through the water hard on the wind in ideal conditions I be very happy. If she will make half a knot in gale conditions I will be equally happy. The heart of the matter is that the power of the foil to resist leeway has in the gale case been reduced to 2.8 %, very unsatisfactory. To make things worse the need for lateral force in a gale is much bigger than in nice weather. Airplanes have a similar problem. During take off, when they travel relatively slow, they need lots of lifting force. In order to become airborne they employ flaps. That is, the rear portion of the wing rotates downwards. Flaps are high lift devices. They also reduce the stalling speed. I have decided to use flaps on my leeboards – detachable flaps. 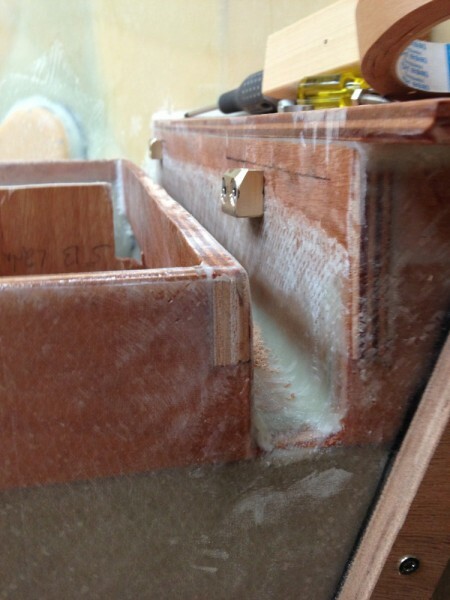 I will have an asymmetrical leeboard on each side, asymmetrical because they are more efficient. 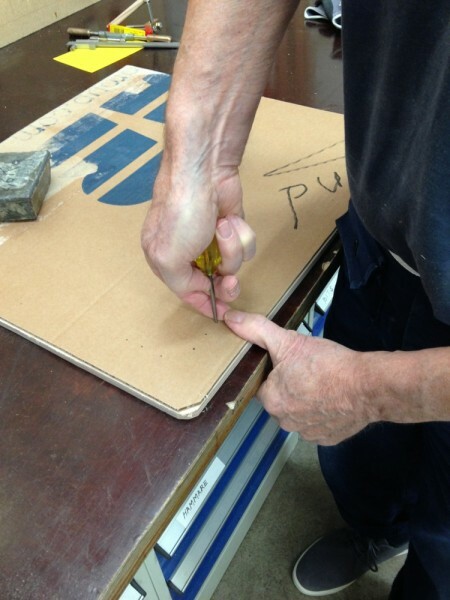 I will use a slotted flap. They allow fluid to pass between the foil and the flap. That way I will have no problem to seal the gap. I will place the flap not in the same streamline but in the way a jib and main are positioned in relation to each other, with a bit of overlap. 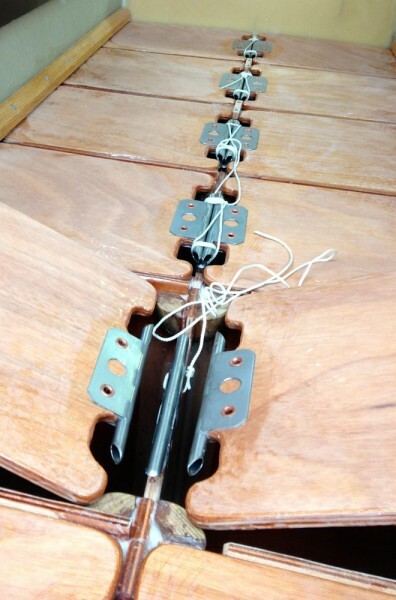 In good conditions the flap will stay on deck because the leeboard itself will be sufficient to prevent leeway. That way drag is reduced. I only need one flap as I can flip it bottom for top using it on both sides. When I put the flap on and take it of, the leeboard will be out of water. That way I can easily do the work from the hatch. In nice weather I increase the sail area and reduce the lateral area. 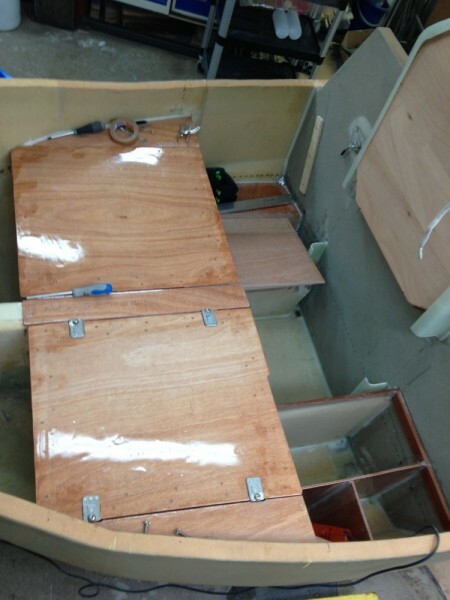 In rough weather I increase lateral area and reduce sail area. Before I add an object to the boat I ask myself, do this thing earn its keep? In this case I believe it does, for the following reasons. Not many small boats have been cruising the roaring forties and not many people live there. What we know about the weather there comes mostly from big boats. But, big boats are not stationary observers, often they voluntary travel with east moving weather systems. That way they can enjoy and report strong westerly winds for long periods of time. Compared to bigger boats Yrvind Ten with her speed of about two knots can be considered almost stationary. She will experience completely different weather patterns. She will be exposed to two or three lows each week. When a depression has passed there will often be nice easterly winds – not adding much to the progress. From a stationary observers viewpoint the roaring forties is not a strong trade wind. To complicate matters there are also strong easterly gales. Once, when I was less experienced I rode one out in comfort to a sea anchor. When the weather had moderated and the sun came out I fixed my position. I had been set back 150 miles. Some navigators may think that’s a good deal, not me. My present boat will hopefully be able to fight gales head on. The new strategy to deal with contrary gales is to dig in, to hold on stubbornly – at the risk of being capsized – until the wind swings over to a more favorable quarter, then I will ease the sheets and run. Slotted flaps are high lift devices. They reduce the stalling speed. I am betting on that they will earn their keep. However one must not forget that in stormy conditions flow around foils is very turbulent. One reason for that is the circular movement of the water particles in a wave. At the top of the wave they move in the same direction as the wind at the trough in the opposite. In a gale the speed difference is often more than six knots, a speed far higher than Yrvind Tens. Accordingly, theoretically, the flow around the foils will vary as a sine curve, sometimes being positive, sometimes negative. In reality turbulence will create much chaos. Then only a lot of lateral surface prevents leeway, a bit like a parachute. So in stormy conditions Yrvind Ten needs all the lateral area she can get. The slotted flap will not only increase lifting force when there is flow, it will also at the same time increase lateral area. The leeboards itself are already as big as I dare to make them. The flap laying on deck. Slotted flap on healead boat. Front vieuw. First he built cars with people sitting outside. On rainy days that was wet and uncomfortable so he added a cabin with windows. Then came the windscreen wiper. Today windscreen washers supplement them. Let nature be your guide. Complicate things and you will be successful. Even the simplest cell is more complicated than a boat. The KISS principle is rubbish. The trick is not to make a new construction simple but functional. My guiding principle is utility. Building a nine feet pivoting mast is no rocket science. A 75 year old pensioner can do it with simple tools. Its complexity is in the beholders eye. Some observers get confused when they see something unconventional. To calm their minds they call it complicated. The same people outfit their boats with outboard engines, electronic steering systems, water makers and induction cookers. They are so blinded by these mass produced products they do not realize that they are much more complicated than my homemade mast. Optimizing each subsystem independently will not lead to a good boat. Of course, non-pivoting masts would be simpler, but then the whole system, the boat, would be more complicated. I would have less trim options. With the planned rig it will be very easy to change from lee helm to weather helm. Hopefully the result is that my boat will steer herself without electronic steering systems or wind vane self-steering gear. I do not think that I ever will convince conservative sailors of the beauty of my rig. They suffer the same mental blocks that Max Planck observed a hundred years ago. Resigned he remarked: A new scientific truth does not triumph by convincing its opponents and making them see the light, but rather because its opponents eventually die, and a new generation grows up that is familiar with it. Still, I wish my critics a long healthy life. Sharpii2 have pointed out that when the masts are not vertical they are acting like a crane boom -true. I like to thank him for that comment. I welcome critics because I often make mistakes and forget details that can have dire consequences. It was a good observation. However I do not worry and it is for two reasons. One, I do not agree, I do not think that it will put a lot of bending stress on the mast and tremendous stress on the pivoting axle and the locking pin. After all, Yrvind Tens masts are not longer than an oar. Small boats do not attract big forces because of the square cube law. 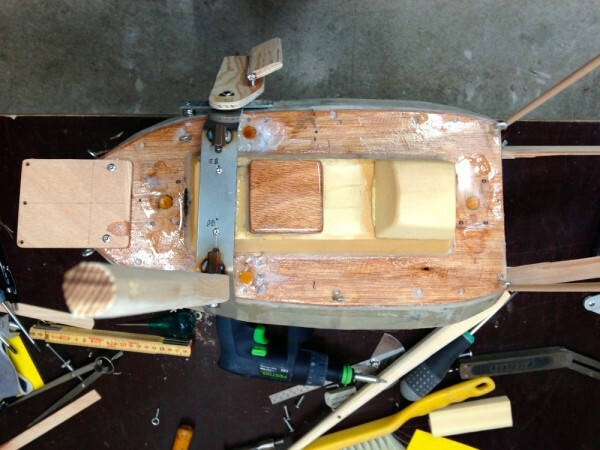 Sure, things break even on small boats but that’s mostly a question of dimensioning and can easily be fixed. 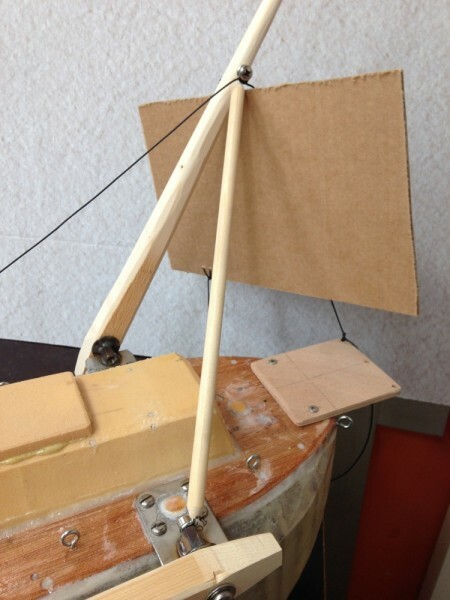 The second reason is that when the wind becomes strong I am going to reduce the forces on the mast and support her. I reef the sail. That brings the yard down to a position six feet above the fulcrum. At that point on the mast there is a fitting to which I tie it with a string. Next I slack the halyard, releasing the compression. At that moment the bowstring effect is no more. True, the wind force is still acting strongly on the reefed sail. However its leverage is now only six feet. To break things you need leverage. Take a match, say 4 cm long and break it, no problem. Break it again, OK. Now its only 1 cm long and it starts to get hard because you do not get a grip. You have no leverage. Most catastrophic scenarios come from big boats disasters. Small boats are different. They are more resilient. Other laws apply. Still I am a man of the belt and suspenders approach. When the wind gets stronger and the seas start to break I snug things down and beef them up. I will then support the mast with an eight feet long spar. I will attach one end to the mast at the height of the yard, six feet up. 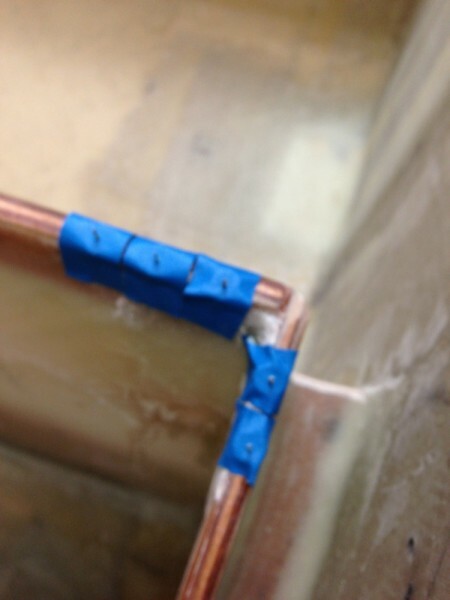 The lower end will be fastened near the root of the other mast on the axis of the fulcrums. With that geometry the mast and spar can be rotated for and aft as a unit. Thus the mast is always supported athwartships. Fore and aft support comes from ropes. If this sounds complicated and confusing I assure you, it is less difficult than setting a spinnaker pole. Below is a pictures of the 1/8 scale model with this arrangement. Click once or twice to enlarge. Above mast forward position, lee helm. Boat ideal will have leeboard. Thinking aboat leeboard has changed my mind. I have decided to have leeboard on Yrvind Ten also. Ocean going boats do not have leeboard, but traditionally ocean going boats are big structures and lika all structures subject to Gallileos square cube law. 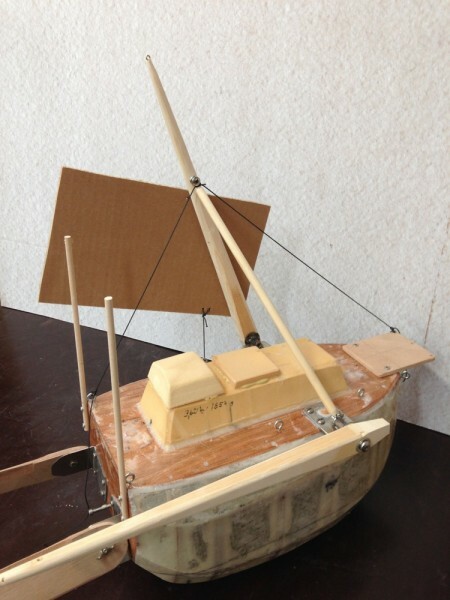 Becouse of the square cube law a small boat do not have to be simular to a big one. In fact its a big mistake to build a small boat simular to a big one. Its against the laws of nature. Bugs understand that. They to smart to try to imitate vertibrates. Each one to its own scale. The present project will then teach me much about them. Good for the next boat. The upcoming circumnavigation will be a lot of down wind sailing. Thats were leeboards excel. Downwind a keel is really bad a centerboard better but there is still the slot causing turbulence. Then the control ropes. Traditionally there is only one rope, an uphaul. but if the boat is going to be capsize-proof you need also a down-haul to control the board in all positions. For piece of mind. I have not got these mechanism to work to my satisfaction. This is not the first time I change my mind regarding centerboards. 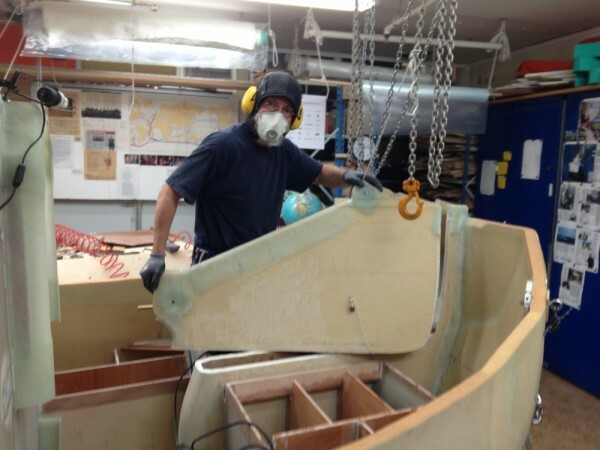 Bris had one to beginn with Yrvind.com started with a centerboard, then a daggerboard I scarped boath of them. Centerboard worked fine for me on Bris- Amphibie, a daggerboard worked fine for me on Duga. Leebards will also give me much more space in the saloon. I am avare that leeboards have its own sets of problem. I will try to solve them later. 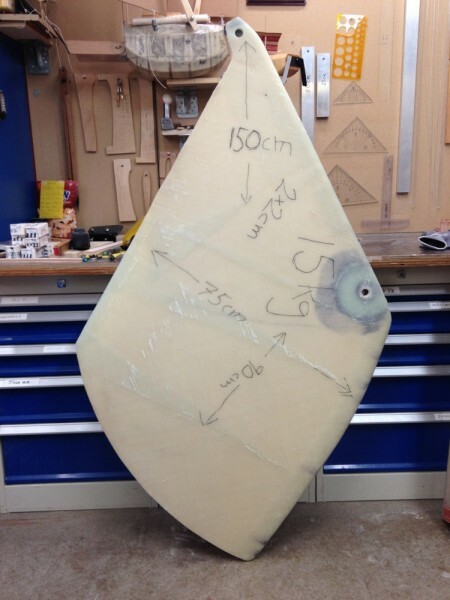 Above the 15 kilo scrapped centerboard. Above. 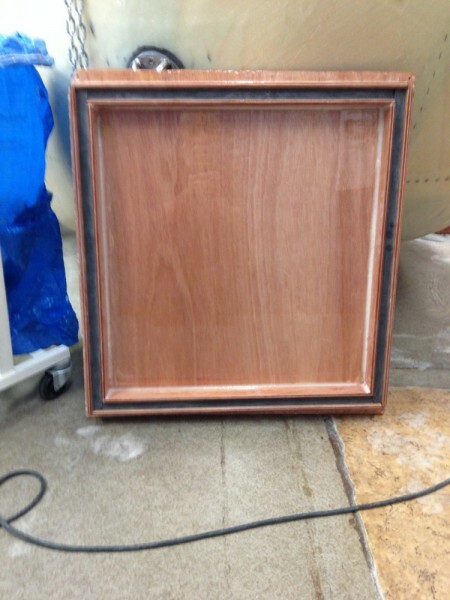 The centerboard case cut off above the storage. Above the turbulence causing opening for the centerboard. Above the turbulent causing centerboard opening starting to be plugged.